Plastic Stacking Containers are the perfect solution for any display. Versatile clear plastic containers can be used for most any product. Stack vertically and attach horizontally for a more stable countertop display. Place on a rack or use without one by stacking these plastic containers sky high on your countertop or shelves. Fill these candy jars with candies of all styles for a colorful display. Make the eyes of all your customers widen with glee as they peruse all your selections. What are you waiting for? Get yours now! People who want to satisfy their sweet tooth, from little kids to grown adults, visit the local candy store. These stores are little pieces of heaven that display and sell the most decadent treats. The best way to display candy in a retail store is in a plastic container. They are durable, affordable, and they let customers see the candy which makes it practically sell itself. Candy stores are all different, but they do have one thing in common: they need bulk candy display solutions to store and sell their sweet treats. There are many different options available, from glass bowls to heavy lidded jars. However, the safest choice for customers and store owners alike is the plastic container. It will not break like glass will, which greatly reduces the threat of harm to people, the store, and the business. This display solution is also the most affordable. When it comes to any kind of retail store, it is important to maximize all potential profits. This means the owner should make the most of all and save money wherever possible. 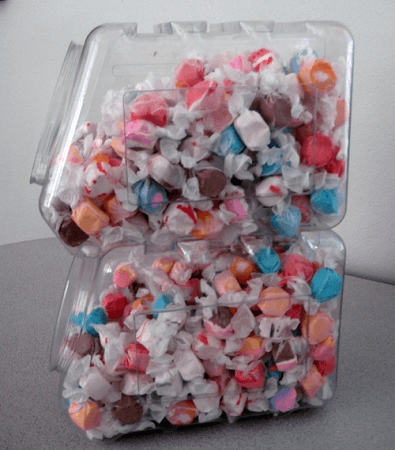 Plastic candy containers are sold by the case at discount prices. They serve the same visual purpose as glass, but at a fraction of the cost. It is important to keep the store organized and clutter-free. A plastic container for each type of candy is the best way to differentiate between sweets while keeping a cohesive look. Displaying bulk or wholesale candy can be challenging because it may appear messy, but using these storage solutions properly can help clean up the appearance of the store and make it more attractive to customers. 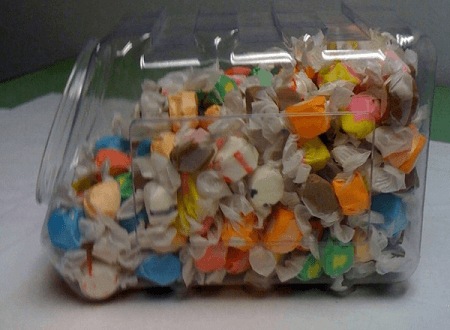 Stores can benefit from putting a plastic container of small candies by the register for any last-minute additions the customer may want to make. These are called impulse buys in the retail world, and many types of businesses implement this tactic. It is a small but effective way to increase a store s UPT (units per transaction) and overall sales. The plastic container is a versatile and useful display option. It is the most effective way to store and sell candy in a safe and successful manner. They are the best candy containers because they make a visual statement without costing a lot of money. The return on the investment of these candy displays is high and will continue to bring in money for as long as they are used. I needed some containers with the option of stackability and these seemed great. The shipment was fast and the products I received are good quality. I would definitely order more soon. Very pleased with these containers. They connect with ease and display the products very nicely. We purchased these for liquor mini bottles & they work great. They connect top to bottom & side to side. So they work great on the counter. To all those liquor retailers out there who are looking for a better way to display their mini 50ml liquor bottles, these bins are the solution. They hold 3 dozen plus bottles and fit together to form cubes. We have them displayed on 12" wide slatwall shelving as you approach the register area. Neat, organized, and easy for the customer to grab and go! I prefer these containers to the traditional fish bowl design. I purchased these containers for my campground store. They stack nicely and create a great display for my candy! Love being able to put lids on them to help keep mice out!